TIM-21 is finally safe and reunited with his creator, Dr. Quon. The endearing boy android is in better shape on the UGC ship getting some proper repairs along with robot dog Bandit. However, when you're the last robot in the colony evil greedy Scrappers aren't too far behind. 'Descender' #4 takes the action down a notch but opens up the narrative of this involving science fiction tale. Jeff Lemire's wonderful miniseries took a quieter turn in issue four with some time to decompress after nearly losing TIM-21 altogether. The boy android is awfully chatty while Quon and Captain Telsa debrief him. The issue of TIM's "dream" is still in debate but he's sticking to his story. Telsa explains that he's under the UGC's protection and he's very valuable to learning the link to the enormous robots known as the Harvesters that wiped out millions of people years ago. This is one of those "glue" issues. It bridges the next act while developing some of the characters. No one does a better job of that than Lemire. We're witness to TIM's naivety but also his self-awareness. He knows he isn't suppose to be able to dream but he did. He knows his "mother" was his human companion's mother but wishes to be reunited with Andy if possible. TIM is an intelligent, wide-eyed boy like any other with some important "DNA" and the ultimate protagonist. Telsa has been portrayed so far as a stern leader with little emotion. Here we get more of her personality and some empathy peeks through. It was a good time to expand on her character to keep from making her one-dimensional. She still lies in a gray area as her motivations aren't completely clear. 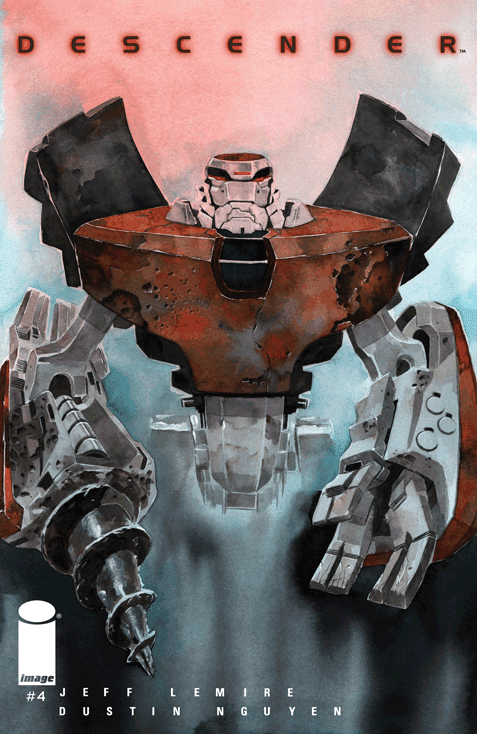 What DustinNguyen does with watercolors is nothing short of magic. From a stark bare page that keeps the focus on TIM, Quon and Telsa to the intricate detail of a space fracas between ships the superior composition and designs give 'Descender' a dream-like appearance. The last page alone is a frame-worthy image. Lemire and Nguyen continue to create an absorbing space epic consisting of big and small moments. A story told through the eyes of a child caught up in a maelstrom. Any good story keeps you wanting more and we can't wait to see what happens next.